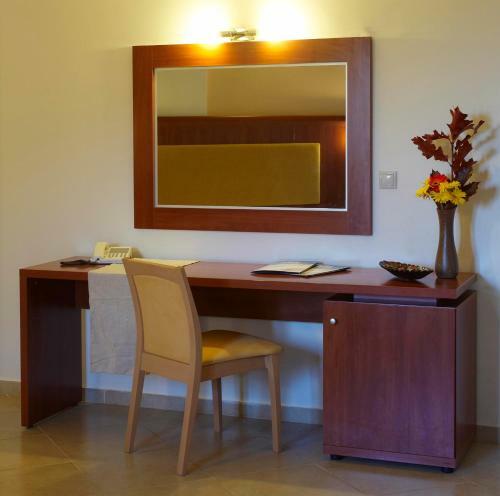 Situated at the foothills of Parnitha Mountain, Parnis Palace offers rooms with panoramic views of Athens. It has a swimming pool and a restaurant serving Greek cuisine. Free Wi-Fi is available in all areas. The air-conditioned rooms of Parnis Palace are spacious and elegantly decorated. They all have a balcony enjoying unobstructed views over the Greek capital. A TV, a refrigerator and a hairdryer can be found in each room. Guests can relax at the swimming pool surrounded by a beautiful garden of Parnis Hotel. A fitness room is also available. Parnis features 4 multi-purpose rooms, which can accommodate various business and social events. Parnis Palace is 7 km away from the centre of Kifissia, 25 km from the centre of Athens and 20 km from Eleftherios Venizelos International Airport. Free private on-site parking is possible. Children and Extra Bed Policy: All children are welcome. One child under 2 years stays free of charge when using existing beds. One older child or adult is charged EUR 20 per person per night in an extra bed. The maximum number of extra beds in a room is 1.